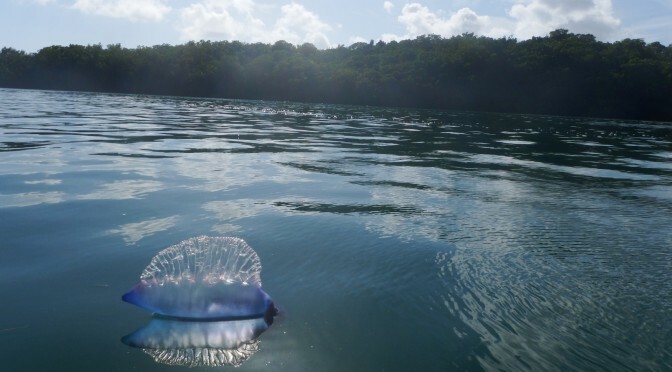 I think most people have heard of Portuguese Man ‘o War jellyfish — and are terrified of the stings they can deliver. I believe very few people, on the other hand, have encountered one. 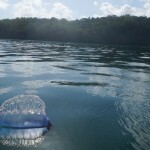 Portuguese Man o’ War Jelly Fish are pretty common in the Florida Keys during certain times of the year. Lisa and I spotted one while we were sitting on in Pearl’s cockpit while parked in the Boca Chica channel off Key West one day. 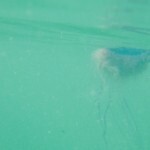 Lisa is an avid critter catcher, so we decided to take a closer look from the safety of the dinghy. 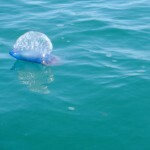 Initially, the Portuguese Man o’ War looks like a partially inflated plastic bag , container of some sort, or possibly garbage. On closer inspection, it looks like bluish sausage with an inflatable sail and a bunch of black strings attached to the bottom. It’s the black stings that are the stinging bits. 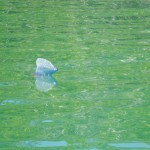 What we found really interesting was that the Man o’ War we followed sensed us and changed it’s behavior. Initially it seemed to want to get closer. After we had looked at for a bit, it seemed to want to get away. 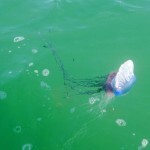 Besides being “sentient” the Man O’ War also seemed to have several little black fish living among it’s tentacles. Curious. Check out the pictures and video below. All in all, this is a fascinating creature. According to Wikipedia it’s not just a single multi-celled organism, but a symbiotic colony of Zooids. You can read the entire wikipedia article for more details.